We all relish spending time outdoors during the warm summer evenings. Unfortunately, this is also the time when the mosquitoes jump out of their daylight hiding spots. These blood hunters are now ready to continue their tight schedule of feeding and reproducing. However, a single bite and one irresistible scratch is all that is needed for a mosquito bite to become infected. What to Do If Your Infected Bite Isn't Getting Better or Is Getting Worse? A persistent mosquito bite can be unbelievably difficult to resist scratching. When you finally give in, a momentary relief greets you, followed by instant regret. It’s very easy to draw blood from the bite since the skin is already stretched and ready to burst. Fortunately, an infection doesn't mean you have contracted malaria or West Nile virus. In fact, it’s not the mosquito's fault, no matter how much we would like to blame it all on them. Infections occur when bacteria enter the first layers of skin, thereby accessing the deeper tissue. An infection will look different on each person. It depends on how bad it is, the location of the bite, and how you treat it. Generally, a minor infection from a mere mosquito bite is no need for too much concern. Doctors usually call a bacterial infection in the middle layers of the skin cellulitis. It occurs when a bite or wound, even scrapes and minor sores, such as a scratched mosquito bite, leave the skin open and vulnerable. It’s important to treat any infection promptly and correctly, as cellulitis, in turn, can cause blood poisoning, or sepsis, if left without care. An infected mosquito bite can also resemble a reaction that has developed due to allergies. This is more common to see in children who haven't built up a resistance to the allergen inside the mosquito's saliva yet. However, the symptoms are a bit different, and if you suspect an allergic reaction from a bug bite, you should seek medical attention. It can quickly escalate and even become life-threatening, particularly in children or the elderly. Some of the most common symptoms of an infected mosquito bite include pain, blistering, or swelling around the area. The skin may appear shiny or stretched and is likely to feel hot to the touch. You may experience chills or shivering, or feel slightly dizzy and fatigued; just an overall ill feeling is likely to overcome you. Other symptoms which could be signs of a more severe infection can involve indications of inflammation, such as redness, that is spreading quickly. Rashes may appear suddenly and can spread. Your joints may tighten up or become swollen and painful. Swollen lymph nodes, fever, build up of pus, and drainage from the bite are serious warning signs of cellulitis. The lymph nodes are small filters that cleanse our body of unwanted bacterias. When we get an infection, the number of white blood cells inside the nodes increases, thereby inflating the lymph nodes. When the lymph nodes inflate, their functions decrease. This means that more bacteria gains access, potentially worsening your condition. Needless to say, it is vital to seek treatment if you experience severe symptoms. If you suspect a mild infection, you can certainly treat it at home. But before you do anything, rinse the bite area thoroughly with soap and water. If it is a suspected infection, it's vital to keep track of its progress. One bulletproof way of doing this is by drawing a line with a permanent marker around the bite. Then you can quickly spot how much and how fast the infection is growing. The next thing you want to do is make sure the area is not enticing you to scratch. Apply a thin layer of an over-the-counter hydrocortisone cream, but avoid getting any into openings on the skin. If the bite is open or broken, just apply to the surrounding area. A hydrocortisone cream contains substances called corticosteroids. These are often very mild, yet highly effective when treating insect bites. It won't do much to the infection itself, other than preventing more damage to the area by calming the itching. However, always consult a medical professional if the bite is on the face, if the affected person is pregnant, or if a child under ten years of age. After you have applied the hydrocortisone cream, you can use a calamine lotion. Calamine lotions work to numb the area; you may already know it from that time you had chickenpox. Calamine will quickly evaporate after contact with the skin. When it diffuses, it will emit a cooling, calming effect on the area where it will prevent further scratching urges. Calamine is relatively safe to use, even for children and breastfeeding women. Just follow the guidelines and dosage instructions. Make sure you check the ingredients, so you know if you are allergic to any of its contents. Every four hours, reapply the soothing liquid to the area. But if the swelling or itching continues, follow the next step. Due to the infection, the area will likely swell. An excellent way of reducing this is by applying ice. Grab an ice pack or even a packet of frozen vegetables, wrap it in a clean cloth and apply to the bite. Do this in intervals of no more than ten minutes at a time. While ice is excellent at reducing swelling, it can actually damage skin tissue if left for too long. For the same reason, do not put the ice directly onto the skin. If you followed the steps above, but the bite is still irritating, your doctor may recommend that you instead take antihistamines orally. This can include medication such as Benadryl. These will only enforce what the topical creams are doing. However, you should always consult your doctor before taking any new medication. If the infection isn't getting any better, it might suggest that you have a secondary infection, for example, cellulitis. When your infection seems persistent, it’s best to seek the advice of your healthcare provider. He or she may recommend taking some stronger medication, or even a hospital stay in case the contagion worsens. Cellulitis requires more intensive treatment than you can provide for yourself at home. Doctors generally treat cellulitis with rounds of oral antibiotics. In more severe cases, they will recommend that you are admitted to the hospital while receiving treatment. This usually applies in situations where, for example, you are experiencing vomiting, diarrhea, or are running a high fever. Also, if you have an underlying condition or a weakened immune system, you might be admitted. Fortunately, with treatment, the infection should clear up within a week or so. There are, however, specific risk groups which might need more extended treatment. This typically involves seniors, young children, or adults with a compromised immune system. Many people can go through life experiencing tons of mosquito bites, yet never encounter an infection. Many times it’s our actions that are going to determine whether or not the bite will get infected. Mosquito bites itch, we all know that. Unless you have strong willpower, it can be difficult to resist. However, if you want to avoid infection, it’s critical that you resist the urge to scratch. When you scratch your skin, you create friction, and this causes the outer layer to peel off. Various bacteria species thrive on our skin, two of which are staphylococcus and streptococcus. When you scratch the bite, these troublemakers can enter the bloodstream and cause infections. As you continue to scratch, more layers suffer damage and eventually peel off too, exposing the more vulnerable zones to the bacteria. To avoid scratching once you’ve been bitten by a mosquito, apply a soothing lotion such as calamine, as discussed above. If you can't find a calming cream in your cabinet, there are also a few home remedies which can help distract you from itching. Green tea bags work wonders on itchy mosquito bites. Let the bag soak in hot water and remove it. You can put it in the freezer until cold and then apply to the area while it is still damp. Peppermint and basil leaves work well too. Rub a leaf onto the area, and it will soothe the itching. Aloe vera is another very effective soothing agent. If the damage is already done, and you've scratched the bite excessively, you should quickly take measures to treat it. First, clean the area. It is best to wash it well in soapy water, then rinse with running water, if possible. Make sure you stop any bleeding. Proceed with applying a topical antibiotic cream around the bite—not on the open wound—and cover with a bandage. The area should stay covered until the broken skin is healed, if possible. As long as the broken skin remains exposed, infections can occur. Healing time depends on how much damage has occurred. You should change the dressing at least once daily. Follow the instructions on the antibiotic cream and apply accordingly. The best way to prevent infection is, of course, by protecting yourself. I know it is not always fun to wear long sleeves and trousers during the summer time. These are the times where we want to stand by the grill in boardshorts, but, by doing this, you're flashing the buffet menu for nearby mosquitoes. Wearing proper clothing that keeps your skin covered is essential for not getting bitten. As soon as a mosquito senses the warmth and odors of your body, it will find you. Additionally, you should use a mosquito repellent. These products will make you unattractive to mosquitoes. Although they're full of chemicals, as long as you follow instructions, these are safe to use. The CDC recommends that you find a repellent which contains some of these ingredients; DEET, oil of lemon eucalyptus (OLE), para-menthane-diol (PMD), 2-undecanone, IR3535 and picaridin. Remember to apply some on your face and scalp too. We tend to forget these areas, generally, since it might be evident if a mosquito is feasting here. Nevertheless, infections can be challenging to treat when occurring on the face or head, so protecting these areas are vital. Spray a small amount of repellent onto your hand, and apply to your face and scalp, avoiding the eyes and mouth. The CDC also suggests that you should apply repellent to your clothes. Mosquitoes can pierce through thin fabrics, but if you spray it with permethrin, it should keep the flying pests away. Permethrin is a fabric pesticide which kills and deflects flying insects. It is convenient to use if you are going on a camping trip as its effects can last a few days. Last but not least, protect your home. We are most vulnerable to bites while asleep. An excellent way of protecting yourself is with an indoor mosquito trap or a mosquito net over the bed. These are easy to use and will keep you protected without chemicals. 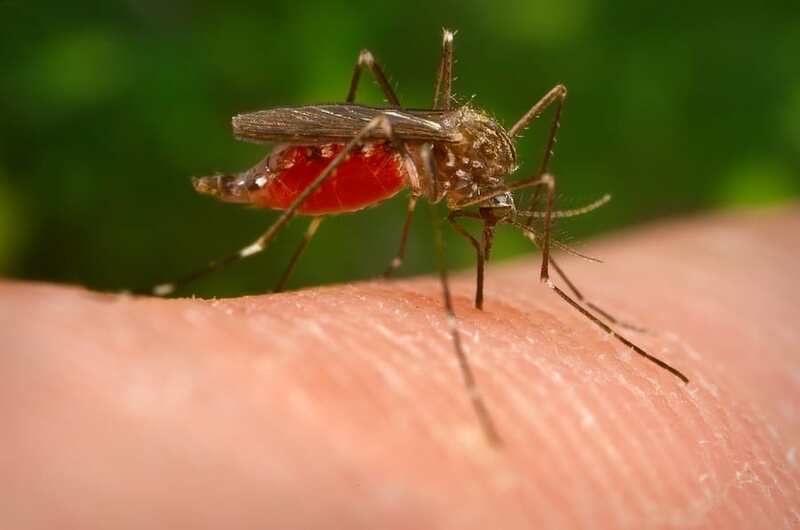 Knowing how to treat a bite is essential to prevent it from turning into an infected mosquito bite. Remember to protect yourself with repellents and always keep a soothing cream handy to help prevent scratching.